But how do they compare to Monitor Backlinks? In this article, I’ll be using each of these tools to check and analyze the backlinks of a website that I own, to see how they compare and contrast. 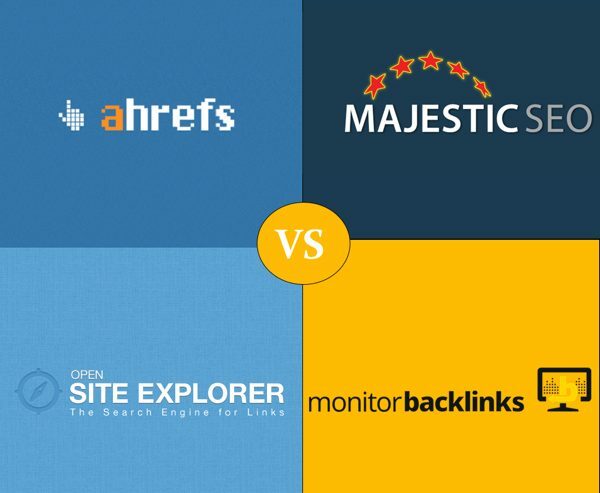 Ahrefs vs Majestic vs Moz vs Monitor Backlinks. I’ll start by checking the total number of backlinks that Ahrefs shows for my website. 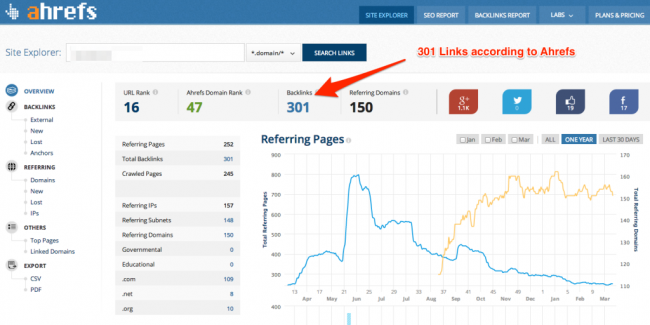 The result is 301 backlinks, which is close to the number I’m aware of, and that I expected to get. Out of these links, 150 referring domains and 220 links are dofollow. The detailed backlinks page is also showing accurate metrics about my links, including social signals, number of external backlinks, the page where the link is pointing to, and when the link was last seen. The Ahrefs backlink checker gets a 5/5 rating. Now let’s see how Majestic SEO compares. I used the Fresh Index rather than the Historical Index to get the most recent data. The results are very intriguing as I’m not aware of having 853 backlinks to my website. It gets even more confusing when I check the Historic Index, which shows that I have 7,285 backlinks. My website is just one year old, and it has 250 backlinks according to Google Webmaster Tools, and has never had more than 400 backlinks. After a quick analysis of the backlinks, I can see the reason why. 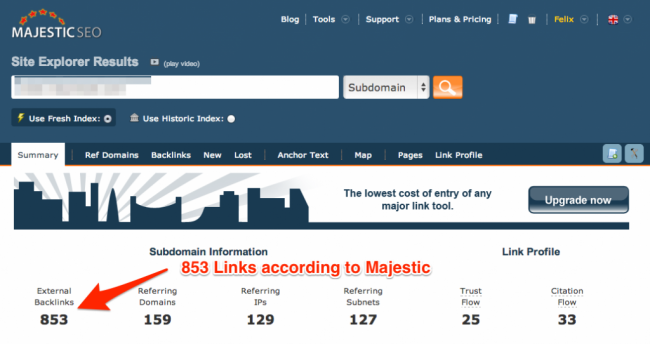 Majestic shows a lot of backlinks that it shouldn’t, like website feeds. These links don’t provide any real value to SEOs or marketers, and should’ve been ignored by Majestic’s crawlers. This information could be confusing to some SEOs and webmasters. The Majestic backlink checker gets a 3.5/5 rating. The next tool to check is Moz. The results show that my website has a total of 284 backlinks, coming from 63 root domains. Moz also provides some useful insights about each link such as Page Authority, Domain Authority, social insights and most linked pages. This result is close to what I got from Google Webmaster Tools and Ahrefs. However, Ahrefs is more accurate and provides better insights than Moz. The Moz backlink checker gets a 4/5 rating. Now let’s see how many links Monitor Backlinks can identify. Using the Free Backlink Checker, I get a total of 292 backlinks from 140 referring domains. The details are accurate, and because Monitor Backlinks is using multiple sources to extract the metrics (Majestic + Moz + Google Analytics), it provides more insights about each backlink including its followed status and anchor text. The downside of this free tool is that it verifies only the top 300 backlinks per domain, and it can only be used for free once a week (unless you have a paid account). The Monitor Backlinks backlink checker gets a 3/5 rating. Ahrefs is great in terms of backlink management, as it allows users to filter the links by multiple metrics. You can find the latest backlinks crawled, and even identify the days when you earned the most backlinks. Ahrefs’ backlink management gets a 4/5 rating. 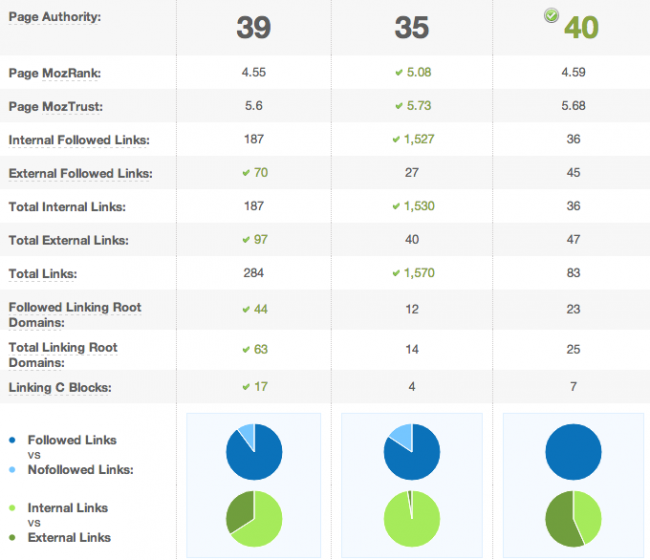 Majestic provides a good range of metrics for your backlinks, including their own ranking system called Flow Metrics (Trust Flow and Citation Flow). You can check the history of each backlink, new and lost links, anchor text distribution, most linked pages, and a world map of the referring hosting IPs. It’s a nice, visual way to analyze where your links are coming from. But how does Majestic compare to Ahrefs? The fact that Majestic’s backlink checker has shown some inaccurate links makes me question how accurate the rest of their data is. Because of that, I’d say that Ahrefs is one step ahead of them. Majestic’s backlink management gets a 3/5 rating. Moz’s Open Site Explorer is one of the most popular backlink discovery and management tools. Without being as complex as Ahrefs and Majestic, Moz offers great insights about each backlink along with a few of the most important metrics. Backlinks can be sorted by several filters, including Moz’s Page Authority and Domain Authority. Moz’s backlink management gets a 4/5 rating. The backlink management part is where Monitor Backlinks really shines as one of the best SEO tools available. Pulling data from multiple sources including Ahrefs’ API, Google Analytics, Moz and others, Monitor Backlinks combines all the information you need, in one place. You can sort your links by several filters, add tags, check their index status in Google, and identify redirects and errors. Just like Ahrefs, Majestic and Moz, Monitor Backlinks also provides details about anchor text distribution and brings together all the quality metrics for each backlink including Domain and Page Authority, Spam Score, MozRank, Trust Flow and Citation Flow. It also does something unique and quite unlike any of the other three tools mentioned above: It sends you email alerts when your website loses backlinks or their status changes. For instance, if a link was to change from follow to nofollow. It also reduces noise by highlighting the new links to your website. Monitor Backlinks’ backlink management gets a 5/5 rating. I really like the graphics and visual statistics in Ahrefs. It’s a very clean and well-designed tool, and gives you accurate information about your website’s backlinks at a glance. Another great feature is the comparison tool, where you can compare your website’s metrics with your competitors and determine where you need to improve. Ahrefs claims to have the largest index of live links, and judging by their backlink checker accuracy, I’d say they’re right. Ahrefs’ features get a 4/5 rating. Majestic is one of the most popular SEO tools, and it has a good backlink checker along with one of the best keyword checker tools. The most notable features include a big historic index of backlinks, a great keyword suggestion tool, and the ability to compare your website with your competitors. But the complexity of the tool is high, and it can be overwhelming for SEO beginners. Majestic’s features get a 3/5 rating. Moz’s backlink checker has a few great features. 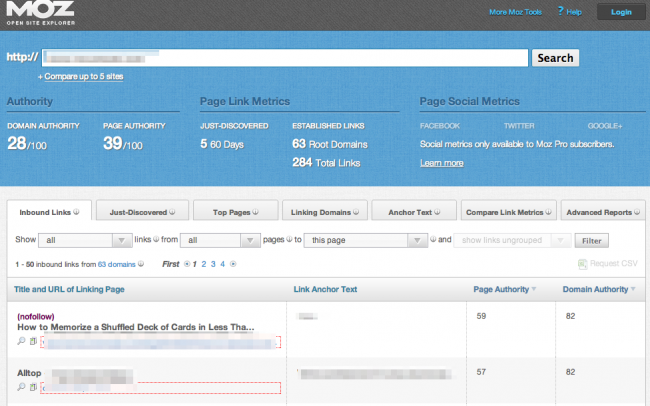 I especially like the “Compare Link Metrics” tab. This comparison feature highlights how your website stands next to your competitors, and gives good insights about opportunities to improve. Another great feature is the “Top Pages” module, which shows your most linked pages. This allows you to understand what content gets the most backlinks. Moz’s features get a 3.5/5 rating. Monitor Backlinks excels at…. monitoring backlinks, and so there are a few things about it that distinguish it from its competitors. First, it uses many different data sources, including Majestic, Moz, and Google Analytics, so you can be ensured that you will get a robust view of your links. We save you time and money because these data sources would be inconvenient and expensive for you to consolidate on your own. On top of that, Monitor Backlinks collects extra metrics for all of the links so that you’ll get a better sense of link quality. This includes data like google index status, IP address, external links, as well as the usual Majestic metrics (Trust Flow, Citation Flow) and Moz metrics (Moz Rank, Domain Authority, Page Authority). Another, important feature of Monitor Backlinks, as I mentioned earlier, is the email alert. After connecting your domain, Monitor Backlinks crawls for new links to your website every day, and sends email alerts when your website or competitors are gaining or losing backlinks. This feature helps you manage your backlink portfolio like very few tools do. 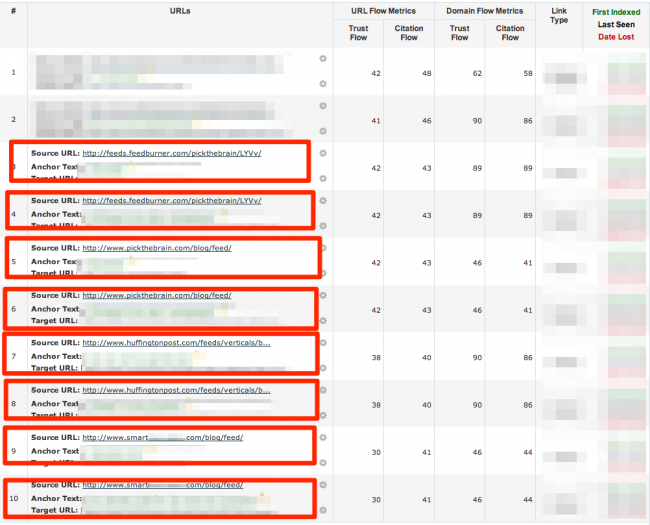 Another great part is that you can see at a glance how the new backlinks to your website are affecting your average keyword position in Google and your organic traffic. This is how you can determine what links or link building strategies have the most SEO value, and replicate them. The third feature is the keyword ranking checker. Monitor Backlinks allows you to track your rankings for your most important keywords, and compares it to your competitors’ rankings for those keywords. Monitor Backlinks’ features get a 4.5/5 rating. Each tool has its own benefits, but most of the time, price is a major selling point. While Ahrefs, Majestic and Moz can be complicated to use for beginner and intermediate SEOs, Monitor Backlinks is very easy and intuitive. It provides all the SEO metrics the other tools do (plus more), for less money. Email alerts with your new backlinks and link status changes. It checks for redirects, nofollows, errors and more. Email alerts with your competitor backlinks, to easily keep up with their strategy. Google ranking comparison with your competitors for your main keywords. The best backlink management module. What are you waiting for? Start with a free 30-day trial today!